In my most recent search to find that standout item on my local grocery store shelf, I once again found myself in the snack aisle, looking for a specific chip a guest recommended. I couldn’t find the product to save my life but my eye kept stopping at a smaller size black package, OFF THE EATEN path™ – a tongue in cheek play on the phrase “off the beaten path”, identifying something that is out of the ordinary or unknown. The brand, supported by the tag line “snacks for the curious™”, did indeed peek my curiosity – with popcorn, cranberries and oats used as visuals on the panel – but I had to ask – what is this product? Finally, my eyes land on a red medallion that states, Kettle Corn Cranberry Granola and then in the smallest type possible the clue “flavored”. Which brings me to my point. 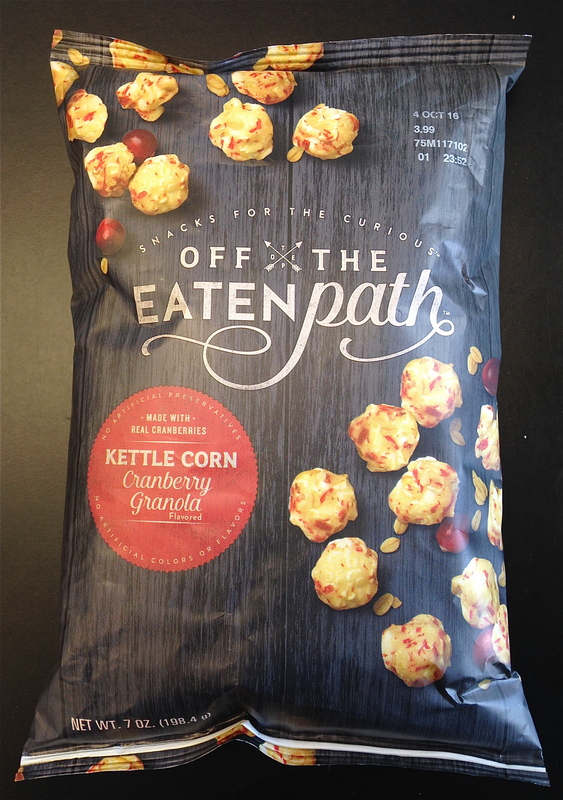 The package design is a bold, clean approach to a new concept in a snack product. It has a very legible elegance in the logo typography that creates the OFF THE EATEN path™ brand, and the supporting communication elements use an equally refined approach to typography. Along with the product images you immediately get the feeling this is a step up in a snack product, but in spite of its elegance and refined graphic approach, it is hard to determine quickly and effectively what this product is. Graphic design is key to the effectiveness of creating brand identity and loyalty but I get the impression that design overwhelmed the communication goals on this package. Elements that should have visual priority use typography that could be enlarged for better legibility. The package did stand out in its category and on shelf and this might be a great new product, but the design didn’t provide me with enough cues, value or intrigue to make a purchase. That is the sole purpose of great design – to generate curiosity and trial of a product. I think the OFF THE EATEN path™ team is close – I would simply advise re-prioritizing their package communication hierarchy and use the same elegance they brought to this package in a more communication-focused approach.